Medigait LLC announces the release of a new device that combines virtual reality programming and real-time motion detection into a cell-phone sized device that helps MS patients restore their ability to walk more normally. The neuroplastic brain response stimulated by this device helps MS patients jump-start the rewiring process inside the patient's brain. Their brain literally rewires itself creating new healthy walking circuits bypassing diseased areas sometimes in as little as two weeks. When I saw these positive results I was amazed, very excited, and gratified. Studies performed over the last few years show many Multiple Sclerosis (MS) patients no longer have to live with a meandering or unsteady gait caused by their disease. According to a study published in the highly acclaimed medical journal "Neurology", closed-loop visual feedback helps MS patients improve their walking. Both stride length and walking speed improved dramatically helping MS patients walk safely. Better yet, a study published in the "Journal of Neurological Sciences" found that when closed-loop auditory feedback was combined with visual cues, MS patients showed even more improvement and confidence while walking. Based on concepts discovered while working on a NASA project helping helicopter pilots to safely navigate around tall objects, Professor Yoram Baram, CEO of Medigait LLC, created the GaitAid Virtual Walker. 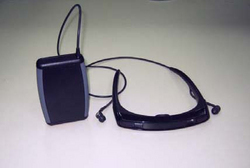 The Virtual Walker is a highly sophisticated device about the size of a cell phone paired with a set of high-tech eyeglasses. 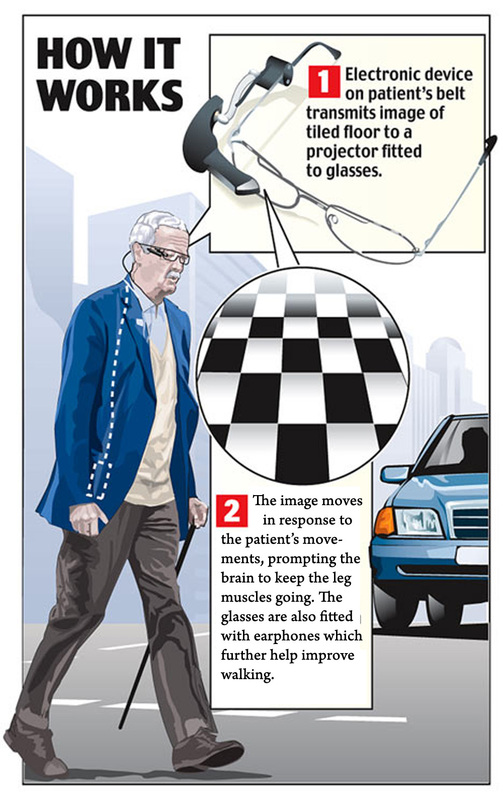 Professor Baram designed this device specifically to help patients with MS and other movement disorders regain their stability while walking. Medigait announces the re-introduction of the GaitAid Virtual Walker to the market after locating a reliable high quality US-based medical device company to build the device for them. The GaitAid Virtual Walker combines proven visual aids and audio feedback helping patients with MS and other movement disorders improve their stability while walking through a process called neuroplasticity. This process essentially rewires the patient's brain by creating new healthy circuits to bypass disease-damaged areas. The National Multiple Sclerosis Society estimates there are approximately 400,000 people in the United States with MS. World-wide about 2.5 million people suffer from MS.
Because MS afflicts both the central and the peripheral nervous systems, not all MS patients show the same symptoms. However, a large percentage of MS patients exhibit loss of balance and muscle coordination affecting their ability to walk safely. Although a cure for MS hasn't been found, the GaitAid Virtual Walker offers a safe, effective, and non-pharmacological method of helping MS patients walk better leading to more productive and safer lives. Clinical studies have shown major improvements to walking speed and stride length in 70% to 85% of MS and other movement disorder patients. Some patients have been helped to the point of no longer needing the device except occasionally to maintain their improvement. "When I saw these positive results I was amazed, very excited, and gratified." -- Professor Yoram Baram Phd. MediGait was founded by Yoram Baram, who received his PhD degree from MIT and is presently a Professor of Computer Science and incumbent of the Roy Matas / Winnipeg Chair in Biomedical Engineering at the Technion, Israel Institute of Technology. The idea for this project was sparked 12 years ago while Professor Baram was designing a mechanism for NASA to navigate low-flying helicopters around obstacles. 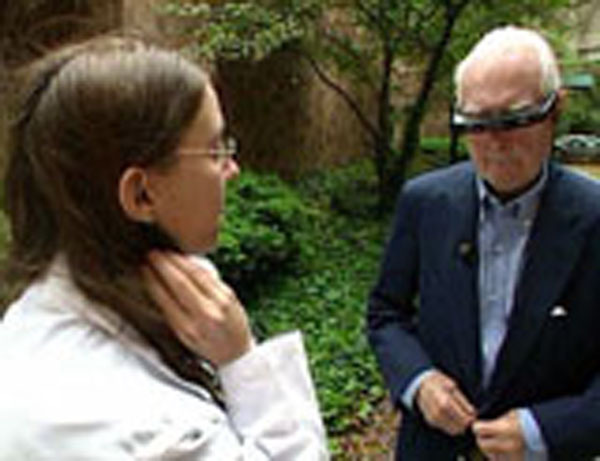 The concept of the design, which Baram later applied to the medical device, is that the optical images of objects help the observer navigate, stabilize and pace movement in space. The Technion-Israel Institute of Technology is Israel's leading science and technology university. Home to the winners of the Nobel Prize in science, it commands a worldwide reputation for its pioneering work in nanotechnology, electrical engineering, computer science, biotechnology, water-resource management, materials engineering, aerospace and medicine. The majority of the founders and managers of Israel's high-tech companies are alumni.